Unless you've been a Frankford area resident for upwards of 50 years, you may not recognize the names "Rose Radio Electric" or "Crest Hardware" or "K&W Family Clothing". The present day Rose Home Hardware has its roots in these earlier business names. To remain successful and survive over multiple decades and generations, a store must adapt to the changing market. That is the fundamental business story of Rose Home Hardware. The Rose family story is one of simultaneously operating a demanding business while raising a family, working alongside family, while committing large amounts of time and energy to the local community. 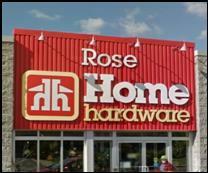 For your interest, we have included a history of Rose Home Hardware complete with photographs. Please click to view some of our historical highlights…. Locally Owned, Locally Operated, Locally Involved.